I just started with twitter, so I hope you’ll start following me, by clicking on the twitter button at the end of this post. You can also email this post to a friend by clicking on the email button at the end. Christie’s and Sotheby’s New York locations used to hold two 20th Century Design auctions per year, in June and December. Recently they’ve each added March sales. The overall quality of the offerings is usually lower, as the sales are used to clean up the excess consignments that accumulate. Sotheby’s was first on March 10th, 2011, with Christie’s selling the following day. The top lot of the sale was a rare and very unusual Magnolia boudoir lamp with leaded glass flowers and mosaic glass inlay throughout. Estimated to sell for $50-70,000, it sold very near the high, for $86,250, including buyer’s premium. 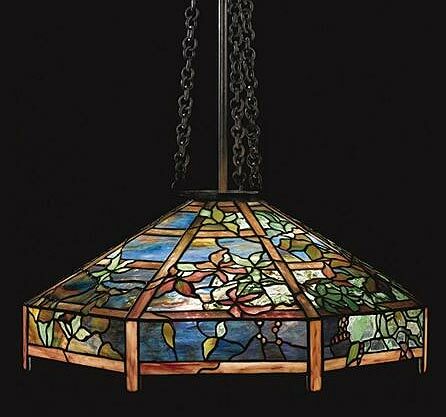 The second highest Tiffany Studios item was lot #13, a beautiful Clematis chandelier. It handily exceeded it’s pre-sale estimate of $30-50,000, reaching $80,500, including buyer’s premium. Total sales were $3,551,816, less than the usual $5-7,000,000 for the June and December sales, but still quite respectable. Click on the following link to view the complete results. Sotheby’s 20th Century Design results. Christie’s sale wasn’t as high-powered as Sotheby’s, so total sales were only $1,435,125. 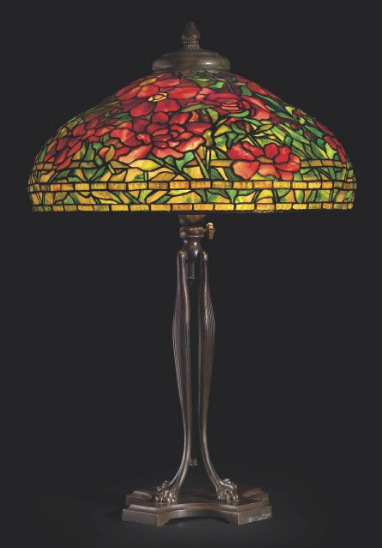 It included a few bargains, in my opinion, such as lot #5, a Tiffany Studios 22″ Peony table lamp. It had been offered in a previous sale, at a much higher estimate, and didn’t sell. Re-offered items have a “stigma” attached to them, many times unjustifiably. This wasn’t the greatest example of a 22″ Peony, but it was still was very good. The flowers were gorgeous, but the background was so-so. Christie’s wanted to make sure it sold this time, so the estimate was lowered to $100,000-$150,000. It sold for $134,500, including buyer’s premium, probably much lower than it would have the first time around, if it had carried a lower estimate and reserve. The second big bargain was for a beautiful, huge Duffner & Kimberly 24″ Peony floor lamp. Estimated to sell for $50-70,000, it sold for $30,000, including buyer’s premium. That’s a very unusual event at major auction houses because the reserve is usually no more than 25% below the low estimate. This lot apparently had a very low or no reserve. I surely wasn’t expecting that or I would have spent more time examining it at the exhibition. For the complete results of the Christie’s sale, click on the following link. Christie’s 20th Century Design results. Jeffrey S. Evans & Associates of Mt. 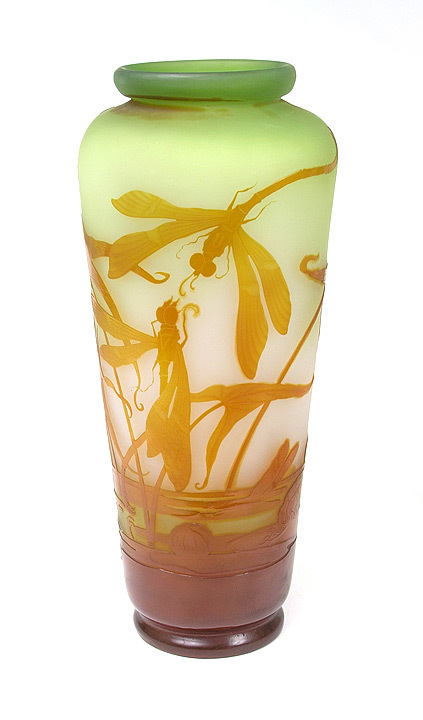 Crawford, VA, held an Art, Studio and Cut Glass auction on March 19, 2011. 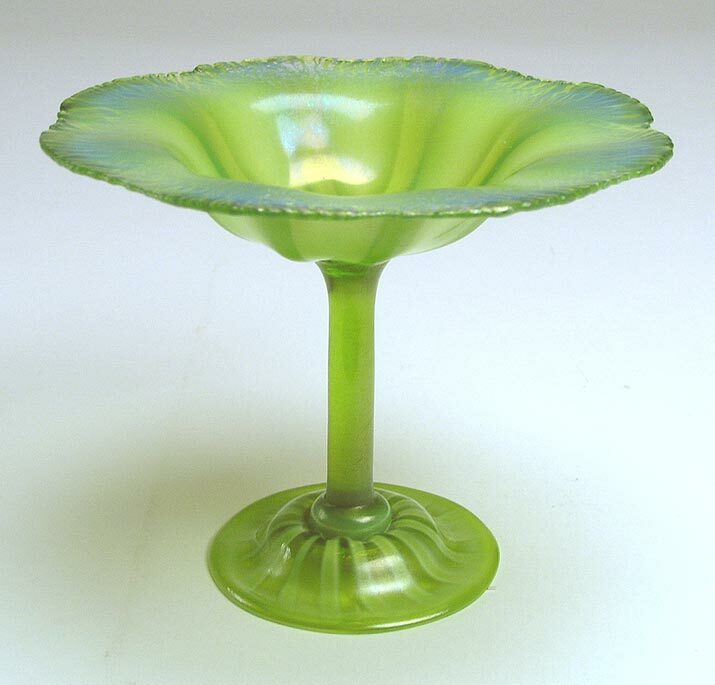 Included in the sale were several good items by Le Verre Francais and Tiffany Studios. 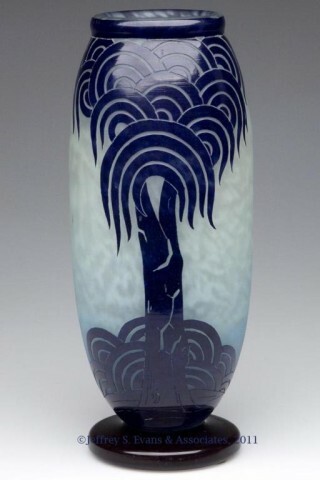 Lot 207 was a rare Le Verre Francais vase in the Palmiers Bleus pattern, 11″ tall. It was estimated to sell for $3-4,000, and sold for $5,100, including buyer’s premium. The Le Verre Francais market has been quiet for some time now, so the result was good for today’s market. This same vase would probably have sold for double a few years ago. Lot 228 was the star of the art glass section. 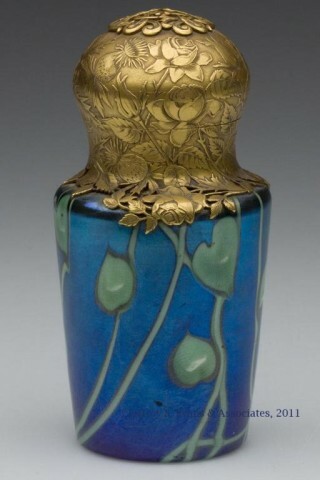 It was a rare blue decorated Tiffany Favrile perfume bottle with an exquisite ormolu hinged top, 4″ tall. Even with a few surface scratches to body, it soared past its pre-sale estimate of $1-2,000, to sell for $13,200, including buyer’s premium. The next lot, #229, a rare miniature red decorated Tiffany Favrile vase, 1½” tall x 2 1/8″ diameter, was from the same collection of Ms. Frances Armentrout of Naples, FL. It carried a pre-sale estimate of $800-1,200, and also flew past its estimate, to sell for $7,200, including buyer’s premium. For the complete catalog of the sale, click on the following link. Jeffrey S. Evans & Associates glass auction. 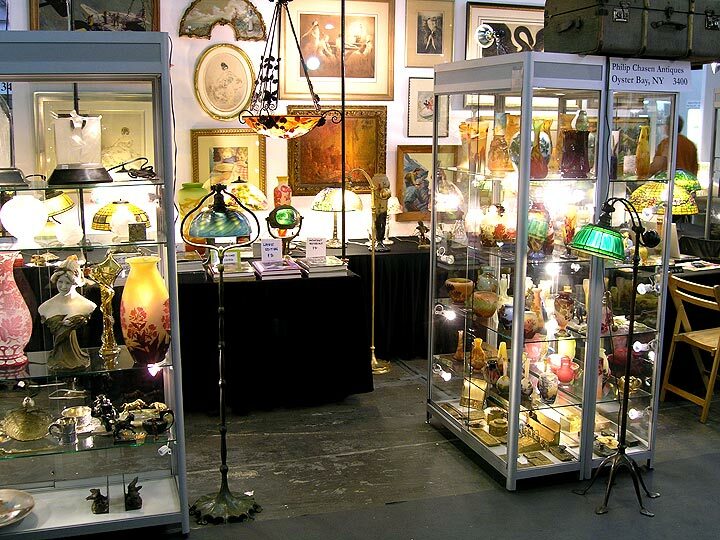 The NYC Pier Antiques Show ended yesterday with mixed results. I heard complaints from several dealers and better news from several others. No dealer I spoke to was ebullient, but I did notice quite a few people walking out with purchases on Sunday afternoon. You would think that New York City would be the best city for me to exhibit, but for whatever reason, it isn’t. Maybe there are too many shows here, or maybe there’s too much competition (but I don’t believe that one), or maybe the collectors are jaded because New York has so many shows and auction houses. Give me Chicago or Miami Beach. The reception is frequently better. Saturday was not a day to write home about. Attendance was decent, but not at the level of some recent shows. The crowd didn’t seem enthusiastic, which probably explains why business was mediocre. Sales on Saturday were across the board, with no one area garnering extra attention. But one day does not make a show. Sunday started very slowly at 10 AM. Why the show opens at 10 AM on Sunday is a mystery. By noon, attendance was only moderate. Noon – 6 PM would be best, but starting at 11 AM would serve everyone well. The dealers would get an extra hour’s rest and the public would still have plenty of time to shop. By 2 PM, attendance and interest had picked up considerably, but with all that interest, there was only one good sale of Daum glass — disappointing, considering all the interest. All in all, a less than stellar show, but still worth doing because it’s quick, local and reasonably priced. 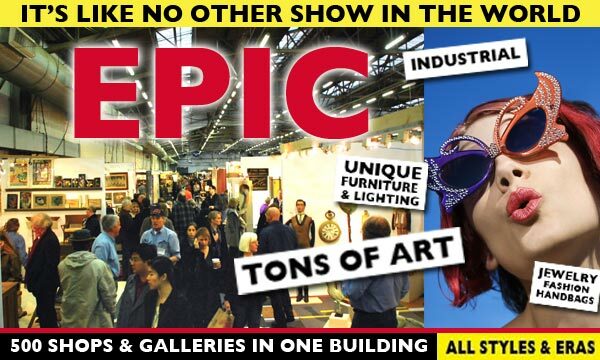 The next edition of the show will be held in the same location on Saturday and Sunday, November 19-20, 2011. Mark it in your calendar and make your plans. The next time I’ll exhibit in New York City will be in the fall at the AVENUE Antiques at the Armory show, Park Ave. & 67th St., September 22-25, 2011. It’s a fancy, expensive show that I hope will attract different attendees than for the Pier Show. It’s a gamble, but one that I hope will work out. The Pier Show is coming! The Pier Show is coming! I don’t have a horse to help me get the message out, but I do have the Internet. Now there’s a thought. Paul Revere would have tweeted about the British. My son tells me I have to get with it and start using Twitter, so soon I’ll figure it out and get with the program. In the meantime, at least I write a blog and can tell you that the NYC Pier Show is coming this weekend, Saturday-Sunday, March 12-13, 2011. The show is a big deal, even by NY standards. There’s nothing quite like it, with very diverse offerings that are difficult to find in today’s shows. This is the way shows used to be, with the antique show in the Madison Square Garden Exposition Rotunda, coming closest. That show was held once a year and the anticipation was amazing. 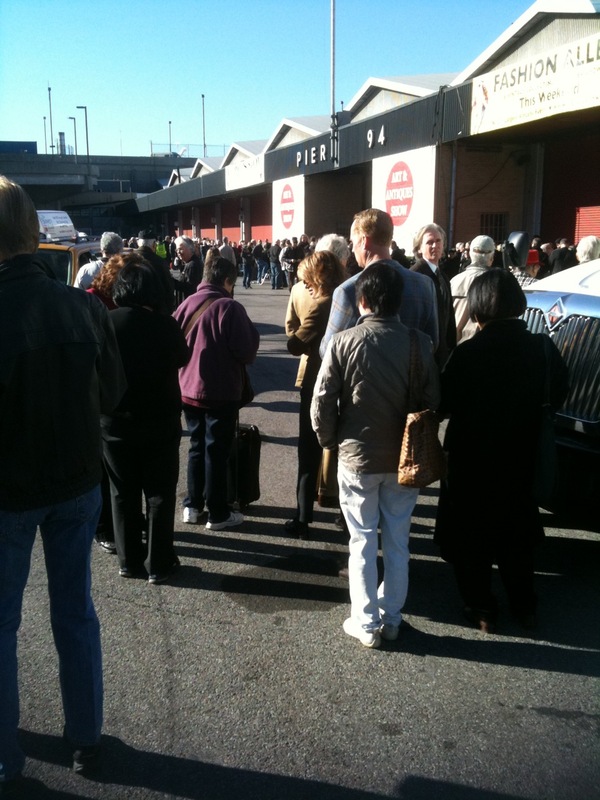 There was always an enormous line that formed when the show began. The lines at this show are huge too. So what’s so good about the show? First is the diversity. You can buy vintage clothing (there are quite a few exhibitors), famous autographs (there’s a new section), costume jewelry, furniture, every conceivable type of decoration from vintage to modern, art, art glass (think me), Tiffany lamps (think me, too). More decorators visit this show with their clients than many other shows. Next is quality, with superb offerings from many of the exhibitors. Last is quantity. 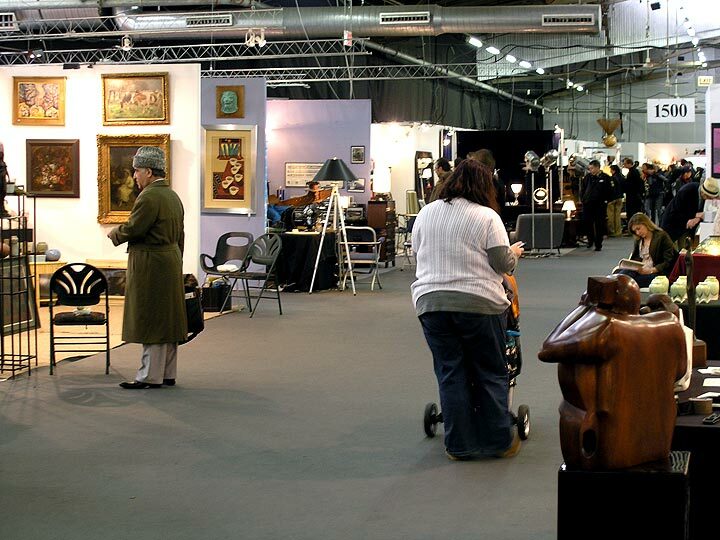 It’s a big show, with many exhibitors, so you’ll be able to find what you’re looking for. I’m bringing many new items that are new to my inventory. I’ve bought very well since the last time I exhibited at the Pier Show in the fall. I’m bringing great new Daum and Gallé items, Tiffany glass from a private collection, a super Tiffany Studios green Linenfold counterbalance floor lamp and lots more. Travelers come from all over the world to shop this show, so make the time to come and visit. You surely won’t regret it. And what’s more fun than playing in New York City for the weekend, with its great restaurants and shows? I can think of worse things to do. Pastel glass of the Louis C. Tiffany Furnaces, Inc. 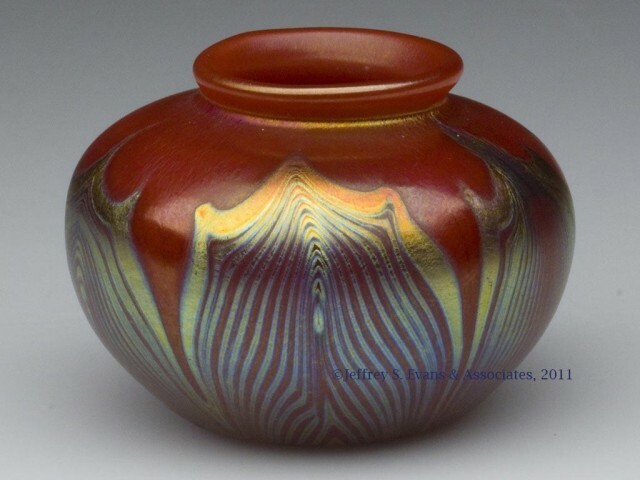 In January, 1920, Louis C. Tiffany Furnaces, Inc., was formed and headed by A. Douglas Nash. 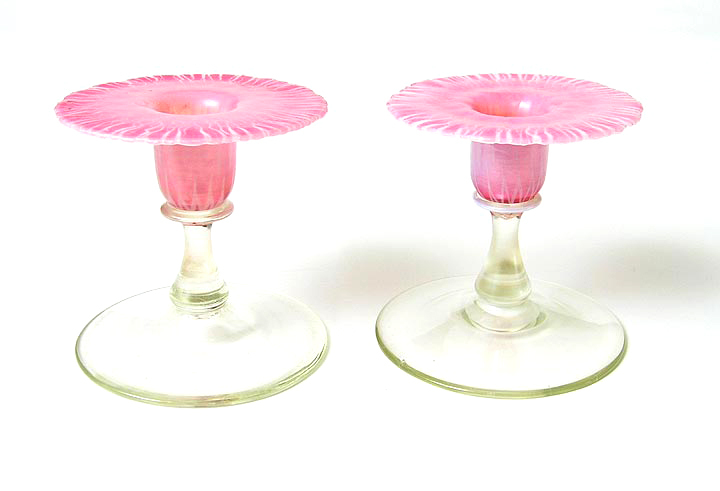 In the decade that followed, a line of pastel glassware was created that proved popular. 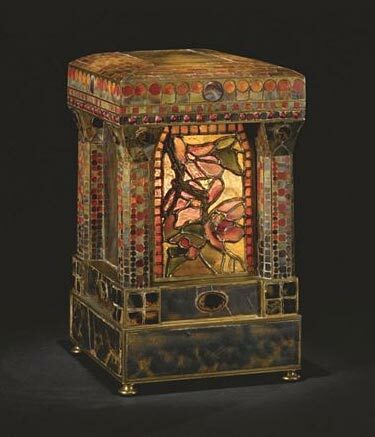 The items were all utilitarian, as opposed to the art glass that Tiffany Studios produced. 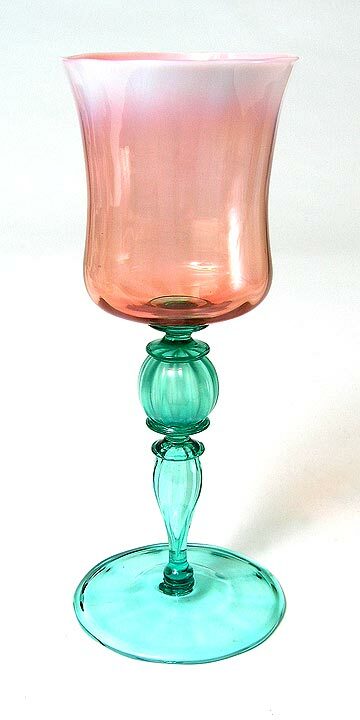 Wine glasses, parfaits, compotes and candlesticks were made in various shades of yellow, green, blue, pink, and lavender. The quality of the workmanship was very high. To those collecting today, certain colors appeal more than others. Pink is probably the most sought after, followed by lavender, blue and green, with yellow trailing the pack. Tastes change, so buy what you like. Doesn’t the “in” color change every year for ladies fashions? Some of the shapes were more unusual than others. A “wedding ring” compote is moderately rare and especially nice. 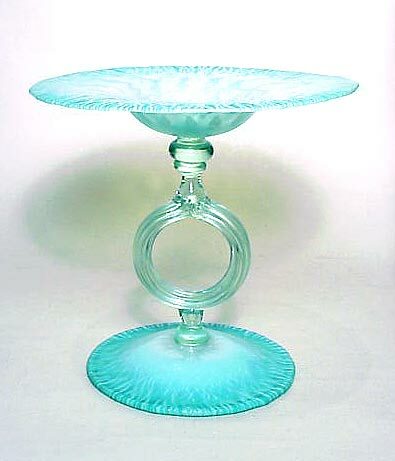 Prices are still very reasonable for pastel glass. If you find it appealing, it’s a great time to enter the market and start collecting. One day, prices may soar and you’ll look back fondly on this time period.